GELONG LODRÖ SANGPO (Jürgen Balzer) is a student of the late Ven. Trungpa Rinpoche and of Dzogchen Pönlop Rinpoche. Born 1952 in Germany, he got his first exposure to the Mahāyāna by playing soccer for a seemingly too long time, before focusing on his studies of educational science, political science and philosophy as part of his education as an elementary school teacher. 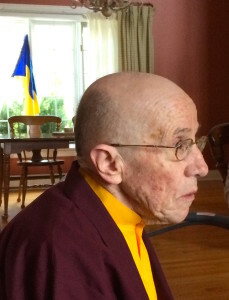 He received his first ordination in the Karma Kagyü Sangha in 1984, France, and then moved to Gampo Abbey, Canada. From 1985–2002 he served as Secretary of International Kagyü Sangha Association of Buddhist Monks and Nuns and published its magazine The Profound Path of Peace. He completed the traditional three year retreat in 1996 and a four year study retreat in 2003. He also served for a few years as Acting Director of Gampo Abbey, was one of the co-founders of Nitartha Institute and served as chair of Vidyadhara Institute, the monastic college of Gampo Abbey, since its inception. His focus of study is in the systematic traditions of Buddhist Abhidharma. He presently acts as head of the Chökyi Gyatso Translation Committee and is the general editor as well as one of the main translators of The Collected Works of Louis de La Vallée Poussin, of which Volume I: Abhidharmakośa-Bhāṣya of Vasubandhu, was published in 2012. He has also translated and published—under the supervision of Prof. Ernst Steinkellner—Erich Frauwallner’s The Philosophy of Buddhism (Motilal) and was engaged for several years in translating the Collected Works of Prof. Lambert Schmithausen. Sangpo has a passion for practice and combining it with the key instructions of the Śrāvakayāna- and Yogācāra-Abhidharma as well as with the bird’s eye view of the pith instructions of Mahāmudrā and Tantra, all of which he likes to call: meditating backwards. Being part of the first group of three year retreatants at Söpa Chöling, Sangpo received a number of teachings in the monastic arts (tormas, musical instruments, sandmandalas; as well as robes) and wrote various manuals and articles on these topics. At present he is President of Karma Changchub Ling. In the next three years, he hopes to be able to finish most of his work as a translator and editor so that he can then spend the rest of his life focusing on meditation practice and giving occasionally teachings. GELONGMA NYINGJE GONGPEL began in the United States with the culmination of daily life confusion that leads one to want to start sitting … . She found that living in communities is the support that she needs; this led her to many types of meditation training over the years: working, singing, walking, gardening, shamatha meditation, pilgrimage, Plum Village meditations, Silent Illumination meditation. At a 2004 New Year’s group retreat in NE Scotland, she got that she was to “go to Pema’s place and cut her hair”. Ten months later she arrived at Gampo Abbey and began sitting. Just sitting in the shrine room awoke Nyingje’s connection to the abbot, the V.V. Khenchen Thrangu Rinpoche and to His Holiness the 16th Gyalwang Karmapa. Just seeing someone else’s desk top image awakened Nyingje to her teacher Mindrolling Jetsün Khandro Rinpoche. Just taking a mahamudra Shedra course there led her to a moment. Such moments led Nyingje to remain at Gampo Abbey for eleven years, receive bhikṣhuṇī ordination from Zen Master Thích Nhât Hạnh, and graduated from the “three year retreat” at Söpa Chöling in August 2017. 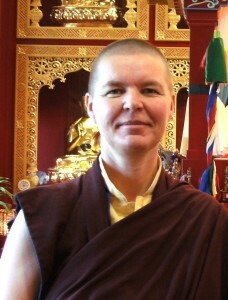 GElONGMA DRIME SHIWA (Saskia Bleijendaal) started her Buddhist path in the Netherlands with the Friends of the Western Buddhist Order. There she led meditation groups, co-led retreats and participated in the Board of the Amsterdam Buddhist Center. In 2008 she left her job in International Relations at VU University Amsterdam and came to Gampo Abbey where she worked as Head of Education for several years. She soon became a student of Dzogchen Pönlop Rinpoche and studied at Nitartha Summer Institute. She also graduated from the Gampo Abbey Shedra and co-taught one of its courses. In 2011 she received getsülma vows from the V.V. Khenchen Thrangu Rinpoche, and gelongma vows in 2017. In August 2017, she graduated from the traditional three year retreat at Söpa Chöling. Shiwa has always tried to find a good mix of study and practice, one informing the other and this will be something she would like to continue doing at KCCL. At present she is one of the directors of Karma Changchub Ling. GELONGMA MIGME CHÖDRÖN (Thelma Habgood) was a student of the late Ven. Trungpa Rinpoche and of the V.V. Khenchen Thrangu Rinpoche. She was born in 1924 in Ottawa, Canada. After receiving her Ph.D., she spent many years in chemistry research and in palynology. Migme loved to play the piano and harpsichord, and was a great lover of Bach, Mahler and Sibelius. In 1973, she became a student of Trungpa Rinpoche and founded/established the Edmonton Dharma Study Group in 1974 which, in 1981, under her leadership, was given the full status of Dharmadhatu by the Vidyadhara, Trungpa Rinpoche. 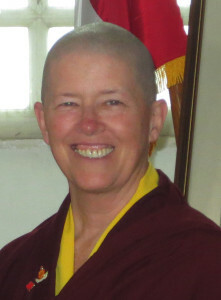 She received bhikṣuṇi ordination in 1994 and was part of the first group of three year retreatants at Söpa Chöling which she completed in 1996. She was a founding member of the Chökyi Gyatso Translation Committee. As a translator from French, she translated Étienne Lamotte’s translation from the Chinese of the Mahāprajñāpāramitāśāstra and his translation of the Mahāyānasaṃgraha, as well as Walpola Rahula’s translation of the Abhidharmasamuccaya, André Bareau’s Les Sectes Bouddhiques du Petit Véhicule, José van den Broeck’s translation of Ghoṣaka’s Amṛtarasa. Before her passing away, she finished the draft translations of all the works of La Vallée Poussin to be published in the future volumes of The Collected Works of Louis de La Vallée Poussin. She was the Vice-President of Karma Changchub Ling.